State Library Victoria – First shot fired! On 5 August 1914, the day Australians learnt of the declaration of war, the German trading ship SS Pfalz was just leaving Port Phillip Bay. The ship had originally planned to depart the previous night, however, a last minute decision to take on additional coal meant that the departure was delayed until the following morning. News of the imminent outbreak of war was on everyone’s mind and the German crew were especially anxious as they slowly steamed towards the Heads. The SS Pflaz was almost into Bass Strait when the Royal Australian Navy examination vessel Alvina received the signal from Queenscliff that war had been declared. The Alvina’s midshipman, Richard Stanley Veale, hoisted an international code flag H, indicating a hostile vessel, which ordered Fort Nepean to fire a warning shot across the bows of the SS Pfalz. A short struggle ensued between the German and Australian on board, before the German’s surrendered. This was the first shot fired by Allied Forces in World War I. 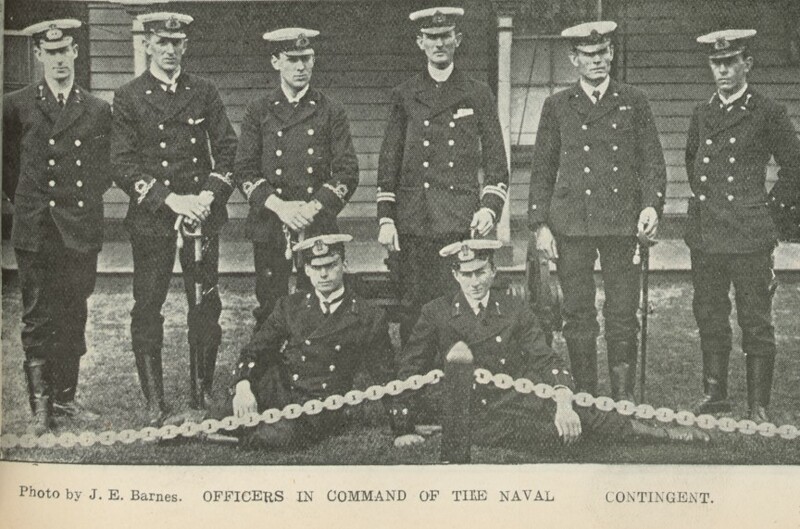 The ship was captured and recommissioned as an Australian troopship while her crew were arrested. Richard Stanley Veale the midshipman who had ordered the first shot to be fired for the allies in World War One, went on to serve in the first Australian Naval and Military Expeditionary Force which fought in what was then German New Guinea – the first site of action for Australian’s in WWI. 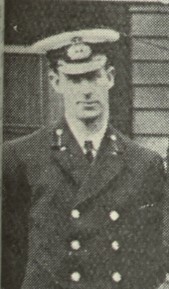 Veale served in the Royal Australian Navy and the Royal Australian Navy Reserve for a total of 44 years, across both world wars. Amazingly, he was also the person who ordered Australia’s first shot fired in World War Two! This story is one of the many presented in the State Library of Victoria’s World War 1 display in the Changing Face of Victoria. The State Library also holds a copy of Richard Stanley Veale’s autobiography, Autobiographic Recollections of a Naval Reserve Officer. 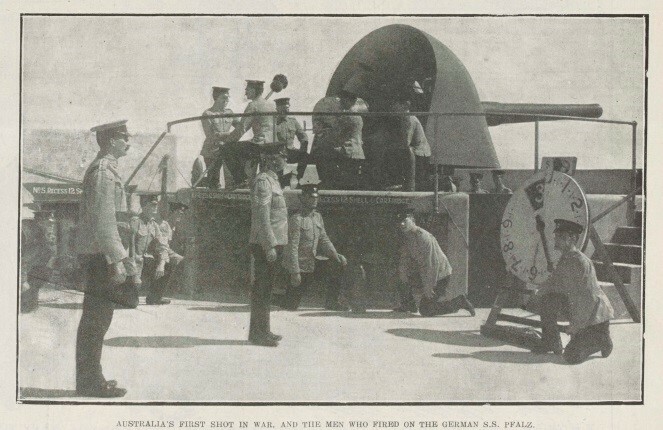 How and when Australia entered the Great War is obviously an interesting question; but to say that the events at Fort Nepean constituted the first “Allied shot” may be nothing more than a myth. We’re aware that this is a contested claim. We based this blog on articles in our collection as well as information from the Australian War Memorial, Victorian government Anzac website and Michael McKernan’s book ‘Victoria at War‘. Britain and therefore Australia’s involvement in the war commenced on the 4th August, and the blog entry is written from this perspective. However, we welcome comments like yours and look forward to uncovering more overlooked facts and stories during the next four and a half years. This story seems to be one that has attached itself to our collective memory, as a simple google search will attest. I went to school in Australia in the 1950s. A friend of mine’s grandfather was Chief Justice (or acting chief justice ?) of Victoria in 1914 and received and, susequently, implemented the relevant instruction from London that any German registered vessel was to be prevented from leaving Port Phillip. Whether shots were fired at or merely across the bow of the relevant vessel i am unable to recollect but almost certainly this was the first military engagement between British Forces ( the gunners of the shore batterywhether AIf or otherwise) were then, as Empire forcces, firmly regarded as part of the UK war effort. Need any more be said. Very interesting, thank you. Can anybody advise whether the Alvina was the steam yacht, built in Southhampton in 1897 (87? ), brought to Melbourne in 1904 and later, from 1949, used for a trans-Bass Strait run? That vessel, definitely called the Alvina, was used as a stationary training vessel for Launceston sea cadets (T.S. Tamar) from 1952 tIll 1961, when it was towed to Beauty Point, near the mouth of the Tamar and beached at Bowen’s Jetty. I heard about the Alvina when I was a sea cadet in Launceston in the 1960s. Some details above are from the Queen Victoria Museum and Gallery (QVMAG) website, though I’m not sure if I have remembered dates correctly.